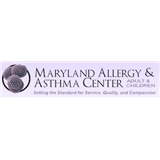 Maryland Allergy & Asthma Center (Silver Spring) - Book Appointment Online! Maryland Allergy and Asthma Center, provides patients with superb allergy and asthma care in a comfortable and luxurious environment. Our dedicated staff has extensive experience in caring for patients with asthma, allergies, and immunodeficiency diseases. We are a friendly team that aims to provide high quality care to all of our patients. We dedicate ourselves to the following principles, standards, and qualities that we consider essential to the pursuit of our mission and we hold each other accountable for the behaviors that embody these values. Our dedicated staff also has extensive experience in asthma, allergies, hay fever, sinus infections, hives, atopic dermatitis, eczema, contact dermatitis, angioedema, anaphylaxis, food, drug and latex allergies. Great doctor with great staff!